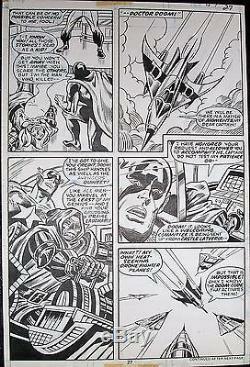 ORIGINAL COMIC ART PAGE out of Super-Villain Team-Up (vol 1)# 10 page 27 from 1977. 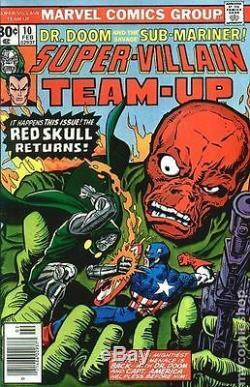 In a rare team-up, featuring both Captain America & Doctor Doom, by Marvel artist extraordinaire; Bob Hall & Don Perlin, there's some classic banter between Cap & Doom. As Cap attempts to compliment Doom on his jet plane, Doom, in classic Doom fashion, replies, Like all men, you marvel at the least of my genius. And I find your grudging praise laughable. Between the awesome art & classic dialogue, it doesn't get much better than this. The art is in excellent condition and comes from a smoke-free home. As with all original art, it shall be packaged with extreme care. Flat, sturdy, and received undamaged. The preservation of original comic art is my 1st & foremost concern. Please note that the comic cover is only a scan. The item "SUPER-VILLAIN TEAM-UP #10 ORIGINAL ART CAPTAIN AMERICA & DR.
DOOM 1977 BOB HALL" is in sale since Thursday, February 09, 2017. This item is in the category "Collectibles\Comics\Original Comic Art\Other Original Comic Art". The seller is "rockin_art" and is located in Henderson, Nevada. This item can be shipped to United States.